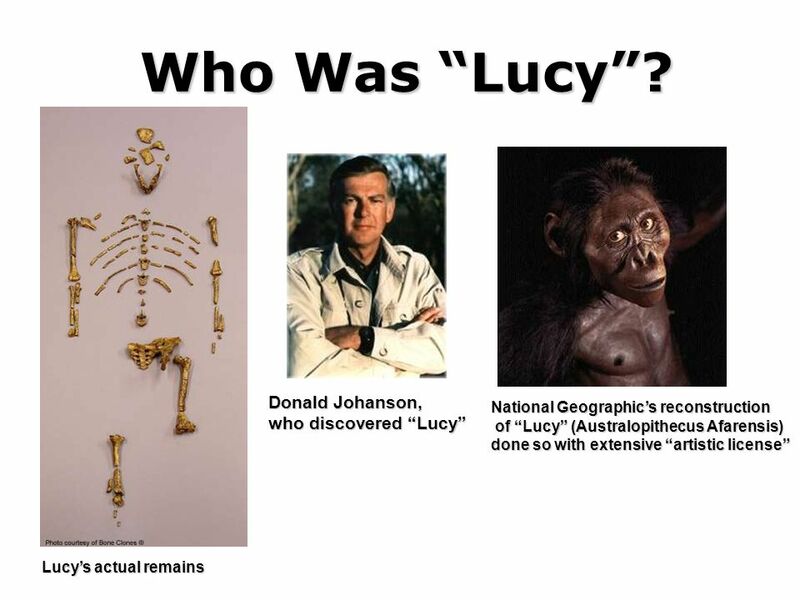 Lucy was found by Donald Johanson and Tom Gray on the 24 November 1974, at the site of Hadar in Ethiopia when they had taken an alternate route on their way back using a Land Rover. The skeleton was given the name “Lucy” during a celebration in the night of November 24, and the Beatles’ song “Lucy in the Sky With Diamonds” was playing over and over. The term hominid refers to a member of the zoological family Hominidae which encompasses all species originating after the human/African ape ancestral split, leading to and including all species of Australopithecus and Homo although these species differ in many ways, they share a suite of characteristics that define them as a group and the most conspicuous of these traits is bipedal locomotion, or walking upright. As in a modern human’s skeleton, Lucy's bones are rife with evidence clearly pointing to bipedality. Her distal femur shows several traits unique to bipedality. The shaft is angled relative to the condyles (knee joint surfaces), which allows bipeds to balance on one leg at a time during locomotion. There is a prominent patellar lip to keep the patella (knee cap) from dislocating due to this angle. Her condyles are large and are thus adapted to handling the added weight that results from shifting from four limbs to two. The pelvis exhibits a number of adaptations to bipedality. The entire structure has been remodeled to accommodate an upright stance and the need to balance the trunk on only one limb with each stride. The talus, in her ankle, shows evidence for a convergent big toe, sacrificing manipulative abilities for efficiency in bipedal locomotion. The vertebrae show evidence of the spinal curvatures necessitated by a permanent upright stance. Evidence now strongly suggests that the Hadar material, as well as fossils from elsewhere in East Africa from the same time period, belong to a single, sexually dimorphic species known as Australopithecus afarensis. At Hadar, the size difference is very clear, with larger males and smaller females being fairly easy to distinguish. Lucy clearly fits into the smaller group. No cause has been determined for Lucy’s death. One of the few clues we have is the conspicuous lack of postmortem carnivore and scavenger marks. Typically, animals that were killed by predators and then scavenged by other animals (such as hyaenas) will show evidence of chewing, crushing, and gnawing on the bones. The ends of long bones are often missing, and their shafts are sometimes broken (which enables the predator to get to the marrow). In contrast, the only damage we see on Lucy's bones is a single carnivore tooth puncture mark on the top of her left pubic bone. This is what is called a perimortem injury, one occurring at or around the time of death. If it occurred after she died but while the bone was still fresh, then it may not be related to her death. There are several indicators which give a fair idea of her age. Her third molars (“wisdom teeth”) are erupted and slightly worn, indicating that she was fully adult. All the ends of her bones had fused and her cranial sutures had closed, indicating completed skeletal development. Her vertebrae show signs of degenerative disease, but this is not always associated with older age. All these indicators, when taken together, suggest that she was a young, but fully mature, adult when she died. IHO has replicas of Lucy‘s bones, which were produced in the Institute‘s casting and molding laboratories. The “real” Lucy is stored in a specially constructed safe in the Paleoanthropology Laboratories of the National Museum of Ethiopia in Addis Ababa, Ethiopia. Because of the rare and fragile nature of many fossils, including hominids, molds are often made of the original fossils. The molds are then used to create detailed copies, called casts, which can be used for teaching, research, and exhibits. The hominid-bearing sediments in the Hadar formation are divided into three members. Lucy was found in the highest of these—the Kada Hadar or KH—member. While fossils cannot be dated directly, the deposits in which they are found sometimes contain volcanic flows and ashes, which can now be dated with the 40Ar/39Ar (Argon-Argon) dating technique. Armed with these dates and bolstered by paleomagnetic, paleontological, and sedimentological studies, researchers can place fossils into a dated framework with accuracy and precision. Lucy is dated to just less than 3.18 million years old. Although several hundred fragments of hominid bone were found at the Lucy site, there was no duplication of bones. A single duplication of even the most modest of bone fragments would have disproved the single skeleton claim, but no such duplication is seen in Lucy. The bones all come from an individual of a single species, a single size, and a single developmental age. In life, she would have stood about three-and-a-half feet tall, and weighed about 60 to 65 pounds. Australopithecus afarensis may have walked upright and looked somewhat human-like, but they were much smaller than we are. Lucy died as a young but fully grown adult, and stood only 1.1m (3.7ft) tall and weighed in at a paltry 29kg (64lb). Lucy's cause of death cannot be determined. The specimen does not show the signs of post-mortem bone damage characteristic of animals killed by predators and then scavenged. The only visible damage is a single carnivore tooth mark on the top of her left pubic bone, believed to have occurred at or around the time of death, but which is not necessarily related to her death. Her third molars were erupted and slightly worn and therefore, it was concluded that she was fully matured with completed skeletal development. There are indications of degenerative disease to her vertebrae that do not necessarily indicate old age. It is believed that she was a mature but young adult when she died.